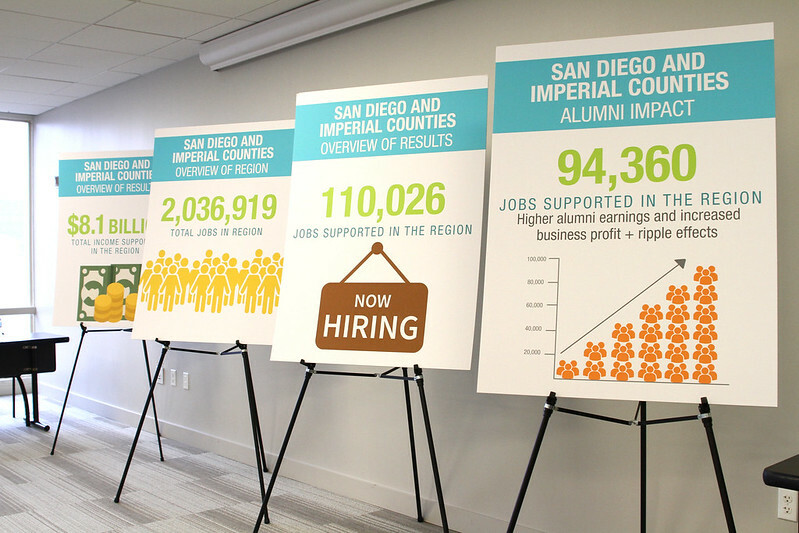 A new study (click for PDF) has found that the 10 community colleges in San Diego and Imperial counties contribute $8.1 billion annually in local spending, an amount that is enough to support more than 110,000 jobs. The study by Idaho-based Economic Modeling Specialists, Inc., (Emsi) analyzed spending by colleges on operations and payroll, the monetary benefits of a college education, and the savings to taxpayers through lower social service costs as the result of well-trained and employed alumni. It also factored in the so-called “multiplier effect,” which refers to the generation of jobs that occurs when employees, students and alumni spend their money on food, housing, and other expenses. SDICCCA colleges spent $665.3 million on payroll and benefits for nearly 11,000 full-time and part-time employees, and an additional $509.4 million on goods and services to carry out day-to-day operations. Almost all of that money was spent locally and played a major role in fueling the regional economy. Spending by students attending the 10 community colleges in the region added approximately $307.6 million in added income to the economy. The new skills and greater productivity among former SDICCCA students now employed in the area amounts to $6.8 billion in added income to the regional economy. Taxpayers provided $824.7 million of state and local funding to SDICCCA. In return, taxpayers will receive an estimated present value of $2.4 billion in added tax revenue stemming from students’ higher lifetime earnings and increased business output. Combined with $235.1 million in savings due to reduced demand for government-funded social services, for every $1 spent, taxpayers will receive an average of $11.50 in return. SDICCCA serves almost 240,000 students in San Diego and Imperial counties. Besides the economic benefit through spending by the 10 SDICCCA colleges, SDICCCA works closely with the business communities in the region to offer specialized training and career technical education. California Community Colleges are the largest provider of workforce training in the nation, and Californians with a community college degree will earn $400,000 more in their lifetime than their peers who have only a high school diploma. SDICCCA comprises the Grossmont-Cuyamaca Community College District (Grossmont and Cuyamaca colleges), Imperial Valley College, MiraCosta College, Palomar College, the San Diego Community College District (City, Mesa, and Miramar colleges, and San Diego Continuing Education), and Southwestern College. Data and assumptions used in the Emsi study are based on a number of sources, including academic and financial reports from the districts, industry and employment figures from the U.S. Bureau of Labor Statistics and the U.S. Census Bureau, and a variety of studies and surveys relating education to social behavior. Emsi is a leading provider of economic impact studies and labor market data to educational institutions, workforce planners, and regional developers. Since 2000, Emsi has completed more than 1,200 economic impact studies for educational institutions in four countries.